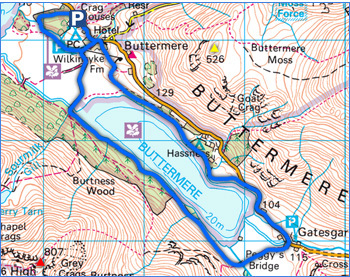 A lovely walk around Buttermere. Just out of the car park and there is a view up to High Snockrigg next to Robinson. Fleetwith Pike and Haystacks at the far end of Buttermere. All is grey and cloudy down by the lake shore. In the opposite direction Mellbreak is getting some sunshine. As well as the fells around Grasmoor. Lovely sunshine on Robinson and High Snockrigg. Perhaps the weather is going to stay like this for the rest of the day? The North Western Fells across Buttermere. A great view from here down the lake. And across the lake too towards Robinson. High Crag up from Comb Beck. Almost at the end of the lake now with a great view to Fleetwith Pike and into Warnscale. High Crag and High Stile. High Crag and High Stile from across the lake. Thats Comb Beck between the two. A final view back to Fleetwith Pike and Haystacks. Haystacks remaining in the sunshine.